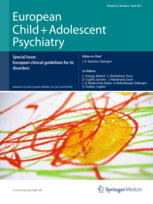 European Child & Adolescent Psychiatry has retracted a 2003 paper on the treatment of alcoholism for a vague “copyright violation.” But the reason appears to be that the article was largely identical to a 2002 report from one of the authors and other colleagues. The offending paper, “Acamprosate and its efficacy in treating alcohol dependent adolescents,” appeared in June 2003 and has been cited 51 times, according to Google Scholar. The authors were Helmut Niederhofer and Wolfgang Staffen, of the Christian Doppler-Klinik, in Salzburg. This article has been retracted due to copyright violation. About 50 % of adult alcoholic patients relapse within 3 months of treatment. Previous studies have suggested that acamprosate may help to prevent such relapse. The aim of our study was to assess the efficacy and safety of long-term acamprosate treatment in alcohol dependence of adolescents. Methods: In this, double-blind, placebo-controlled study, we recruited 26 patients, aged 16–19 years, with chronic or episodic alcohol dependence. Patients were randomly allocated treatment with acamprosate (1332 mg daily) or placebo for 90 days. Patients were assessed on the day treatment started and on days 30, and 90 by interview, self report, questionnaire, and laboratory screening. Findings: 13 acamprosate-treated and 13 placebo-treated patients completed the treatment phase: of those withdrawn, 11 (1 vs 6) relapsed, 5 (3 vs 2) refused to continue treatment, 3 (1 vs 2) had concurrent illness, and 2 (1 vs 1) had adverse side-effects. At the end of treatment, 7 acamprosate treated and 2 placebo-treated patients had been continuously abstinent (p = 0.0076). Mean cumulative abstinence duration was significantly greater in the acamprosate group than in the placebo group (79.8 [SD 37.5] vs 32.8 [19.0] days; p = 0.012).Interpretation: Acamprosate is an effective and well-tolerated pharmacological adjunct to psychosocial treatment programmes. Aims: About 50% of alcoholic patients relapse within 3 months of treatment. Previous studies have suggested that cyanamide may help to prevent such relapse. The aim of our study was to assess the efficacy and safety of long-term cyanamide treatment in alcohol dependence of adolescents. Methods: In this, double-blind, placebo-controlled study, we recruited 26 patients, aged 16–19 years, with chronic (frequent and regular) or episodic (frequent, but irregular) alcohol dependence. Patients were randomly allocated treatment with cyanamide (200 mg daily) or a placebo for 90 days. Patients were assessed on the day the treatment was started, and on days 30 and 90, by interview, self-report, questionnaire and laboratory screening. Patients were classified as abstinent, relapsing or non-attending. Time to first treatment failure (relapse or non-attendance) was the primary outcome measure. Results: The cyanamide (n = 13) and placebo (n = 13) groups were well matched in terms of baseline demographic and alcohol-related variables. Mean cumulative abstinence duration was significantly greater in the cyanamide group than in the placebo group. Apart from occasional diarrhoea, there was no difference in side effects between groups. Conclusions: Cyanamide seems to be an effective and well tolerated pharmacological adjunct to psychosocial and behavioural treatment programmes for the treatment of some adolescent alcohol-dependent patients. Because of reported hepatotoxic, haematological and dermatological side effects, patients should be observed continuously by experienced clinicians. Further studies are necessary to prove the efficacy of cyanamide in adolescents. Beyond the immediate similarity of the text, of course, is the curious overlap between the study design — same number of subjects, same demographics — and the different drug used in each trial. That raises a bright red flag, we’d think. We emailed the editor of ECAP and will update this post if we hear back. There was indeed the copyright violation as indicated. We have informed the various institutions where the first authors did work about this issue but as a journal, we did not ourselves (inquire about) issues of scientific integrity. I think it is well known that alcohol causes double vision at certain levels, hence nothing surprising. It appears that the authors used one manuscript as a template for the preparation of the other. It is a very tempting thing to do especially if English is not a writer’s mother tongue and the subject matter of the two studies is very similar. In this case, they did virtually identical studies using two different drugs. I have a nagging feeling that the placebo-treated controls were also shared between the two studies. Not sure if the latter is a big deal, though – the authors could just as well have 39 subjects and split them into three groups (drug 1, drug 2, placebo) and run the two studies concurrently. It would save both time and money. They are not poor in Austria. You’d think that they could pay for a science/medical translator. Sometimes I see very helpful translations. There are translators, and perhaps people such use them more often. Since this is a clear case of “triple vision”, I say that the work of the Spanish team: Joan Benach (author), Carles Muntaner (autor), Carme Borrel (editor of Gaceta Sanitaria), Vicente Navarro (editor of International Journal of Health Services) trumps the above mentioned Austrians! For those of you who are still in doubt regarding the existence of well-organised international groups conspiring for getting more public funds (in the form of grants, etc.) from different countries, which are based on the number of publications, here is some evidence about the long-lasting and very close collaboration between the members of above mentioned quartet: Vicente Navarro (John Hopkins School of Public Health, USA; and editor of International Journal of Health Services), Carme Borrell (editor of Gaceta Sanitaria, Spain), Joan Benach (Universitat Pompeu Fabra, Spain), Carles Muntaner (University of Toronto, Canada). Please, note that all four of them have other thing in common – JHSPH, which makes one wonder whether JHSPH provides breading ground for misconduct. Hmm. That’s one big copyright violation. Maybe there’s more going on here. Apparently, not, if you ask WHO or Baywood Publishing, or Vicente Navarro, or Carme Borrell, or Universitat Pompeu Fabra, or the University of Toronto! Regrettably, by ignoring this case and all my correspondence, Elsevier is joining this group!! To my ultimate surprise, for over one year now COPE is deflecting this case, although that Elsevier is COPE member!!! Credibility of Elsevier and COPE is not measured by how they deal with those editors who adhere to the rules, but by how they deal with those who do NOT adhere to the rules. Elsevier should get rid of any editor who does not adhere to the rules, and COPE should get rid of any publisher who does not adhere to the rules. Otherwise, both Elsevier and COPE erode their own credibility!